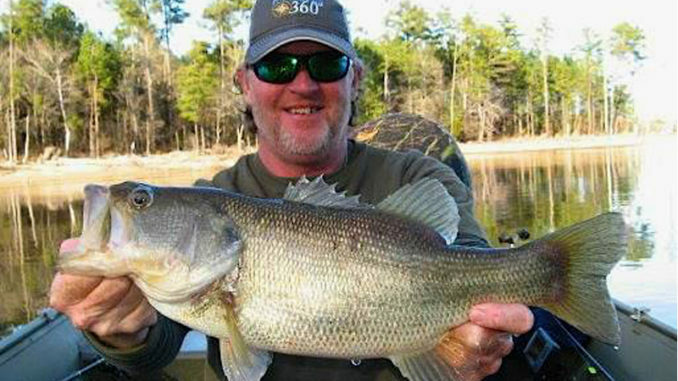 Tony Alexander is a master of spoon fishing on Lake Murray. It’s early February in the Carolinas, and with unseasonably warm temperatures, a lot of anglers are back on the water. And most of them are catching plenty of fish. Crappie, stripers, and largemouth bass are the main species biting in lakes all over both states. Anglers love the spring-like temperatures, but do the air temps transfer to the water this time of year? And how do the fish react when a cold winter turns into 70+ degree days? Donald Shull of Denver, N.C. said this turns the fish on as much as any other time of year. That’s especially true when the air temperature warms up for at least three consecutive days. “If it was late March, I would not like this big temperature swing. At that time of year, the fish are either spawning or getting ready to, and some have already spawned by then. And a big jump in temperatures then is going to push those fish out of their normal areas that they’d usually be that time of year. But this early in the year, it just turns the bite on,” he said. And Shull said when we have an Indian summer in February, one lure and technique will beat all others, no matter what species of fish you’re after. “Some people call it spooning, some call it vertical jigging, and some call it perch jerking. Whatever you call it, it’s deadly this time of year, especially during a warming trend,” he said. 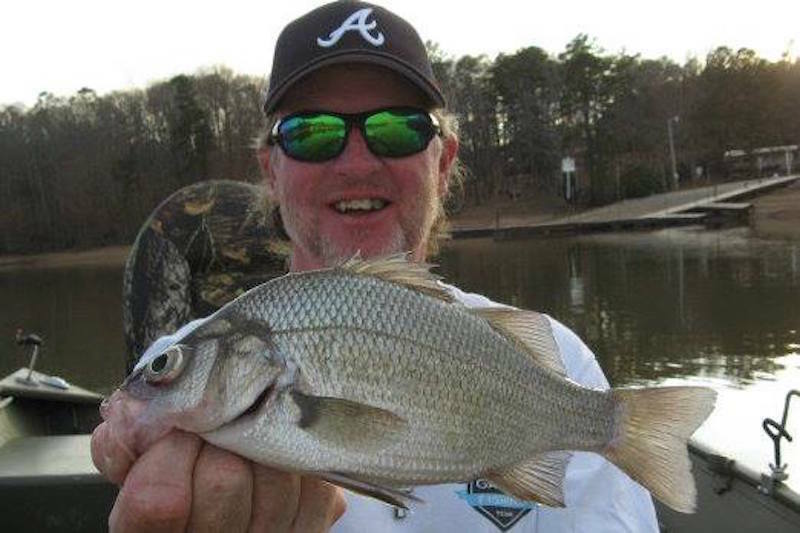 White perch also fall for the “perch jerking” spoon trick. When perch jerking, anglers drop a spoon straight down to the bottom, then jerk the spoon up and let it fall. And they repeat this process until they get a bite. It works this time of year even when it’s cold, but Shull said it’s even better when it warms up this time of year. Shull said there’s nothing fancy about this type of fishing. He catches mostly bass, crappie, and stripers, but he said it’s not uncommon to hook bream, shellcracker, and catfish when fishing this way. “I use 30-pound test braided line, a 20-pound fluorocarbon leader, a baitcasting reel with a thumb bar, and a Nichols Lures Mojo Flutter Spoon. I like two colors. The Shattered Glass Silver is my favorite. But I use the Golden Shiner a good bit too. My main lake is Lake Norman, but I do it the same way on the Santee Cooper lakes, and Lake Hartwell in South Carolina. 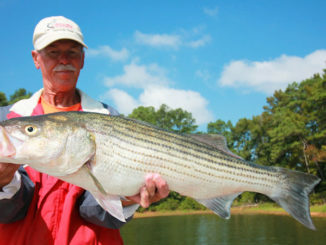 And I catch them this way on Jordan Lake too,” he said. Shull looks for sunken brush piles, sunken logs, deep holes, ledges, and drop-offs on his depthfinder. 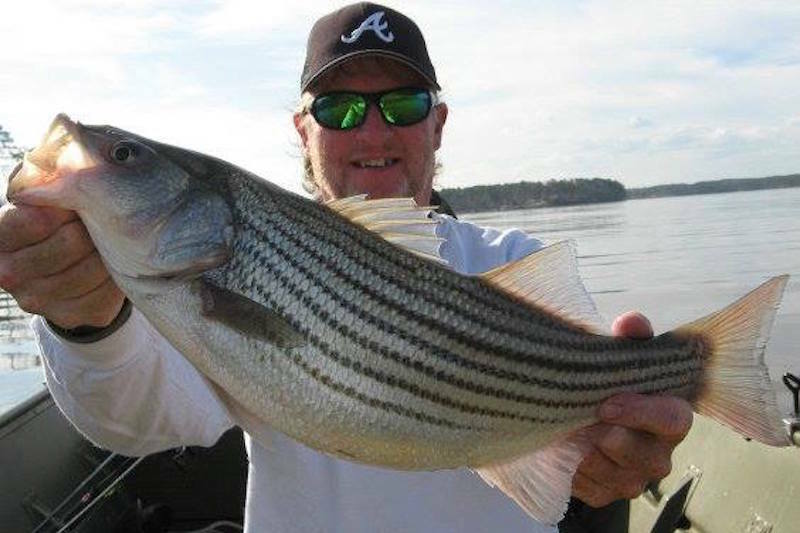 Tony Alexander caught this February striper during a warming trend with a spoon on Lake Murray, S.C.
“I want deep water, and I want to see those changes on the bottom. Then I just drop my spoon down, let it hit bottom, then jerk it up, then repeat,” he said. 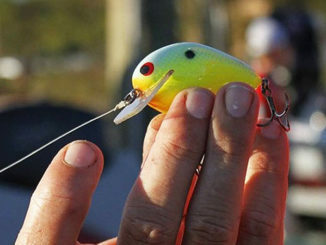 Shull warns anglers to pay attention on the initial dropping of the lure. “The fish hit it on the way down a lot. And this time of year during these warming trends, they can hit it at any depth. You really need to pay attention,” he said. As much as Shull likes fishing during these warm days in February, he’s said he’s also looking forward to the cooling weather coming to the Carolinas this weekend. “That first cold day — or colder day — after some sustained warm weather is also good for this type of fishing. If the air temperature drops 20 degrees from the day before, those fish are all going to go deep. So they’ll be more concentrated. Sometimes that is an even hotter bite,” he said.